The picture in the background is that of Albury Church, Surrey, England which I took during August 2002. William Oughtred, the inventor of the slide rule, was rector there for 50 years from 1610 to his death in 1660. Herewith is a brief history of his life. ... the time which over and above those usuall studies I employed upon the mathematicall sciences I redeemed night by night from my naturall sleep, defrauding my body, and inuring it to watching, cold, and labour, while most others tooke their rest. Oughtred was ordained an Episcopal minister in 1603. In 1604 he became vicar of Shalford and later, in 1610, he became rector of Albury. Oughtred took private pupils who came to his house and lived there free of charge while they received mathematical instruction. He had many pupils but the most famous were John Wallis, Christopher Wren and Richard Delamain. He was a little man, had black haire, and blacke eies (with a great deal of spirit). His head was always working. He would draw lines and diagrams on the dust.... he used to lye a bed till eleaven or twelve a clock, with his doublet on ... studyed late at night, went not to bed till 11 a clock, had his tinder box by him, and on top of his bed-staffe, he had his inke-horne fixed. He slept but little. Sometimes he went not to bed in two or three nights, and would not come downe to meales till he had found out the quaesitum. Oughtred worked at mathematics in the seclusion of a country vicarage. At Albury he "gave gratuitous instruction to any who came to him, provided they would learn to write in a decent hand." He complained bitterly of the penury of his wife who always took away his candle after supper, "whereby many a good notion was lost and many a problem unsolved"; and one of his pupils who secretly brought him a box of candles, earned his warmest esteem. Oughtred's most important work, Clavis Mathematicae (1631), included a description of Hindu-Arabic notation and decimal fractions and a considerable section on algebra. He experimented with many new symbols including x for multiplication and :: for proportion. Like all Oughtred's works it was very condensed containing only 88 pages. Oughtred used p in Clavis Mathematicae but not for the ratio of the circumference to the diameter, merely for the circumference. Other notation for greater than and less than proved hard to remember and were not accepted, the familiar > and < being due to Harriot at almost the same time. Oughtred is best known for his invention of an early form of the slide rule. Edmund Gunter (1620) plotted a logarithmic scale along a single straight two foot long ruler. He added and subtracted lengths by using a pair of dividers, operations that were equivalent to multiplying and dividing. In 1630 Oughtred invented a circular slide rule. 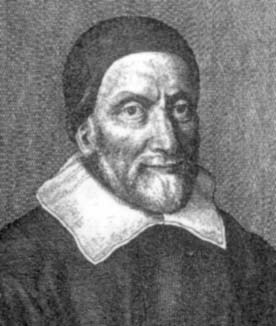 In 1632 Oughtred saw that a simpler and more sophisticated method of multiplication and division could be achieved by placing two logarithmic rules side by side and using the position of the numbers relative to each other to calculate the desired result. Thus by using two Gunter rulers he could do away with the dividers. He published Circles of Proportion and the Horizontal Instrument in 1632 describing slide rules and sundials. There was a dispute however regarding priority over the invention of the circular slide rule. Delamain certainly published a description of a circular slide rule before Oughtred. 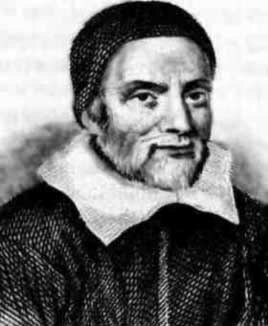 His Grammelogia, or the Mathematicall Ring was published in 1630. It may well be that both invented this instrument independently. Unfortunately a very heated argument ensued and to some extent this formed a cloud over the later years of Oughtred's life. Oughtred's other works were Trigonometrie (1657), one of the first works on trigonometry to use concise symbolism, and a number of more minor works on watchmaking, solving spherical triangles by the planisphere and methods to determine the position of the sun. He also published Circles of Proportion and The Horizontal Instrument in 1632 describing slide rules and sundials. 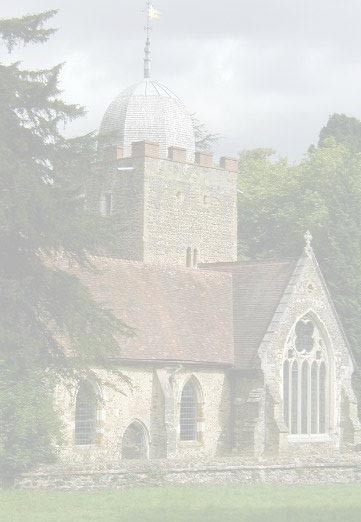 Albury Church, Surrey is shown below. This map may be controlled by your mouse.